“They always run that stop sign,” said Bob Saringer, 62, on the corner of Egan and Alice Streets, where he’s lived for 18 years across from Calhoun Middle School. Many of the students walk home through the neighborhood, located just north west of the downtown square, avoiding traffic as they dart across busy Oak and Congress Streets, clutching backpack with two hands. “We hope there’s not a day when someone gets hurt,” he said, the sun fading. Saringer, who retired from UNT two years ago, said that he’s seen a lot of new and diverse neighbors throughout the years. “There were renter problems, with parties,” he said about the continual fresh import and export of college students who rent homes in the neighborhood. Saringer helped establish the new homeowners association in 1995-96 for the neighborhood. Among the neighbors, a multitude of former (and current) stray cats can be seen peeking through the lattice and windows of homes, kittens keeping to the porches. Bob Saringer, and Amos (left). 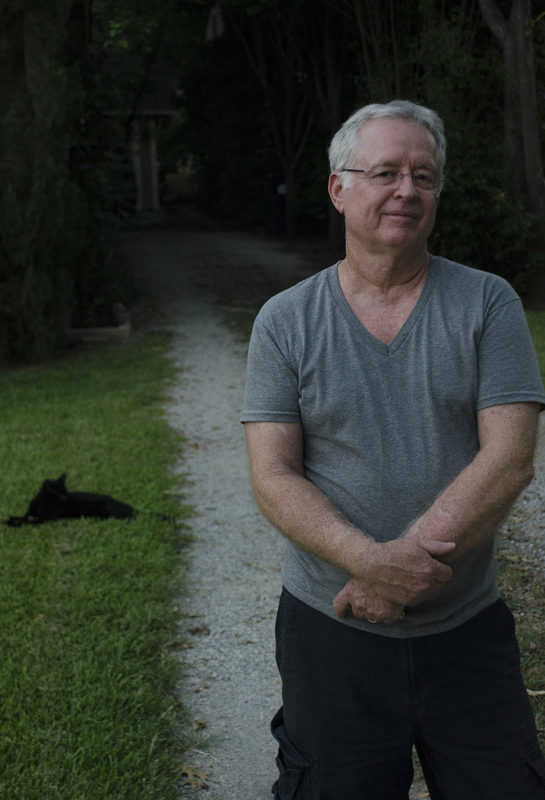 “That’s Amos,” said Saringer, his thumb pointing to a black feline that trailed him on the evening walk, as he paused to lay in another neighbor’s perfectly sheared lawn of cool Saint Augustine grass. These are everyone’s cats. “We all look out for them, and for each other,” he said. Considered the inner-city neighborhood, there is no shortage of character, charm and diversity. Filling homes are a few pastors and not a few members of The Village Church, well-known musicians, business-owners and politicians. The Pecan neighborhood is one of the oldest in the city. Many of the homes were built in the 1920’s and ‘30’s, as the northern edge of Denton. Homes which have noticeably undergone renovation, filled with families, stand at a contrast to some original and seemingly untouched town-homes, interspersed down Egan and Panhandle Streets. Some sides of the road are dead silent and dim past 9 p.m., while other streets glow with lights strung around open windows and doors, their tenants heard laughing and playing music from within. “It’s always cool to hear the kids playing out around the track of the middle school, and hear the bands, the square. It’s actually very comforting, and gives it a nice feel,” said Saringer. Jeffry Eckles, who lives off Egan and makes a living as a freelance bass player, likes to go over and have coffee with the neighbors, “something you can’t always do in other neighborhoods,” he said. “It’s a walking neighborhood. I can walk to the square, the bank, the store,” said Eckles, who hosts a night of jazz performances at 7 p.m. Wednesdays at The Whitehouse, a coffee shop down the street. Nicknamed “Jamhandle” for all of the bands and performers which one can hear practicing, Panhandle Street borders the football field of Denton High School, it’s stadium lights blazing overhead. “First down, ten yard line,” announces the scorekeeper, echoing over the trees. Beyond the stadium, one can hear the low hum of the Denton High School drumline, a full moon hanging over the risers, sparse on a Monday night. 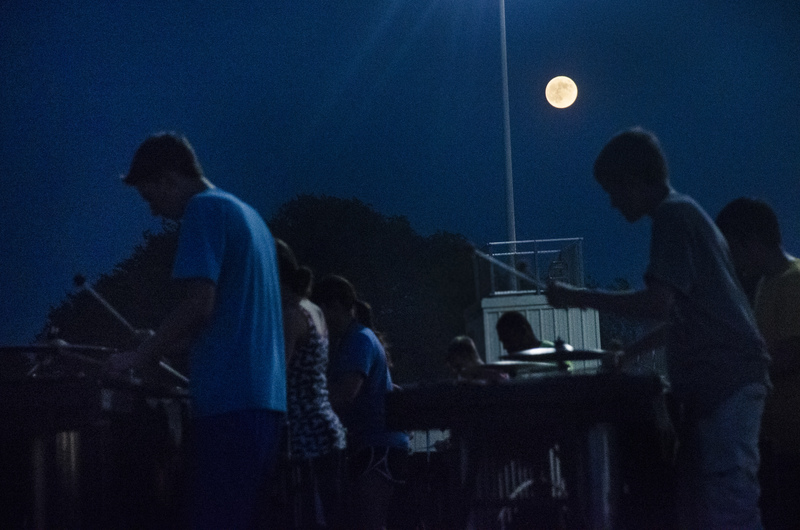 Denton High School students practice during rehearsal for an upcoming competition, under a full moon Sept. 8. Students from Calhoun cheer them on. Ella Eckles, 12, is with her friends, and without her dad for the first time. “I think it’s really cool living in a college town,” she said. Many of the students who live in the area that attend Newton Razor Elementary School, later go onto Calhoun and then to Denton High. Joy Faulks, assistant principle of Calhoun, watches the stands (and this reporter) to make sure students are safe. To Faulks, the diversity of the schools in the district – minorities share nearly an equal percentage with whites – reflects positively as the schools boast some of the best scores in the city, she said. “It’s a slice of the way the real world is,” she said. Robert Brannock, director of the Denton High School percussion section, said that many people can carry wrong views about the neighborhood. “This school gets a bad rap for being an inner-city school, and for the diverse population,” he said. The presence of crime in the area is minimal, according to Denton Police. “As far as I can tell, it’s pretty safe,” said officer Erich Coulston, as he waited outside Mary Jane Stadium with Faulks and a student, who waited for a ride home after the football game. As for the neighborhood, “there’s not a whole lot going on there,” Coulston added. However much is going on where it is, drugs are not unique to Pecan, said Panhandle resident Jordan Kerzee, who attends The Village Church down the street. Kerzee said that upon moving to the neighborhood in 2007, he confronted much of the stereotypes surrounding the school district. “People would say to me, ‘Are you going to raise your kids at DHS?’ Yeah, why wouldn’t we?” he said. “That’s so dumb. That’s such a dumb opinion,” he said. Kerzee estimated that The Village Church makes up about 15 percent of the residents of the neighborhood-at-large, extending to Oak Street and Bonnie Brae Road. “The Village really cares about this neighborhood. It’s the neighborhood that we live in,” he said. 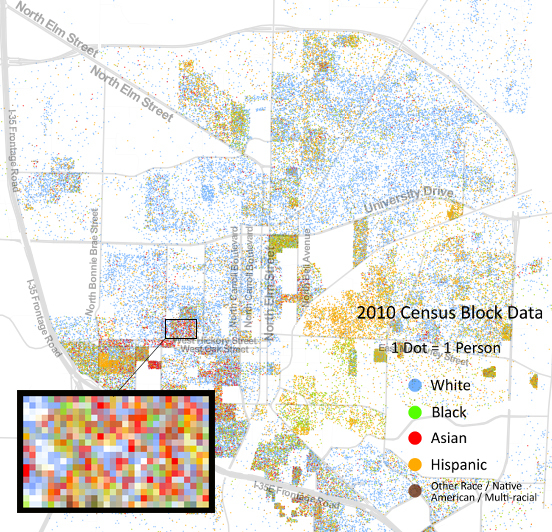 Kerzee brought up on his computer a map of Denton showing demographics, called a racial dot map, of 2010 census data nationwide provided by the Cooper Center, viewable here. North of the railroad tracks and south of Interstate 35, blue dots cover the majority of the landscape. There’s a cluster of orange dots, pockets of green, and dense packs of red, with small spots of brown in the mix. But there’s one small rectangular area, just north of campus, that is unique. “You can see that this is…probably one of the most diverse areas,” said Kerzee. 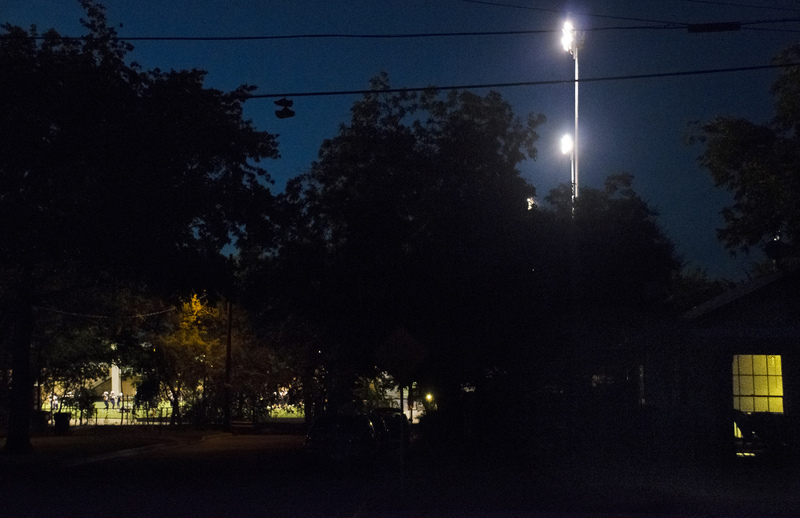 Shoes hang on a wire on Panhandle Street, during a Denton High School football game Sept. 4. 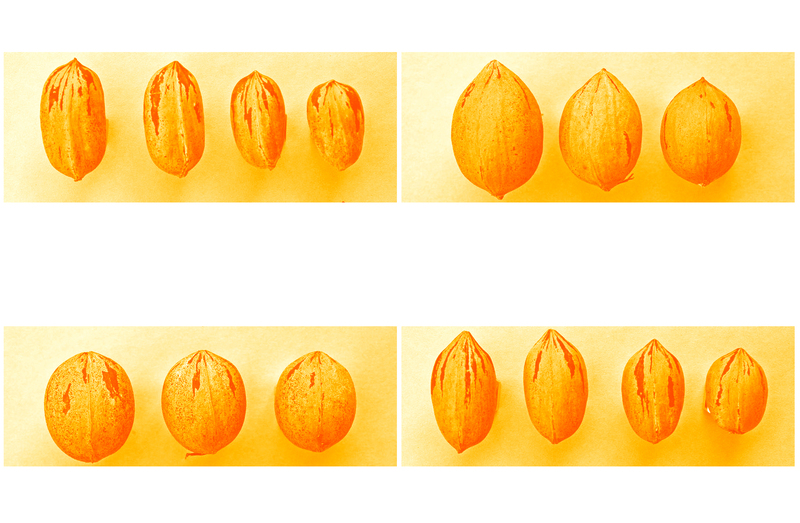 “At one point, they meant something. 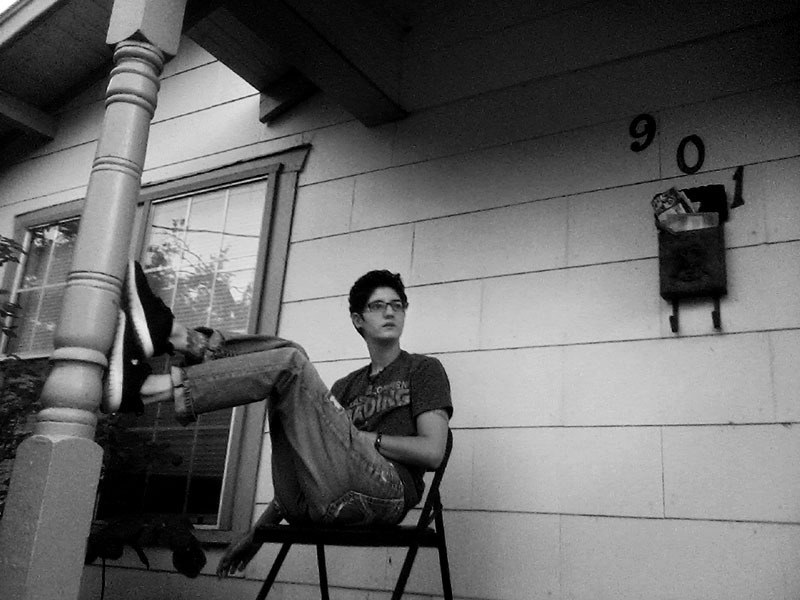 Another time, they meant nothing,” said Jordan Kerzee, renting a home off Panhandle Street, about the shoes. He noted that it doesn’t necessarily mean a drug dealer lives nearby.